The M30 Apoptosense® CK18 Kit (ELISA) is a unique tool for reliable and reproducible quantitative detection of apoptosis in epithelial keratin 18 (K18) (cytokeratin 18 [CK18]) positive cells. 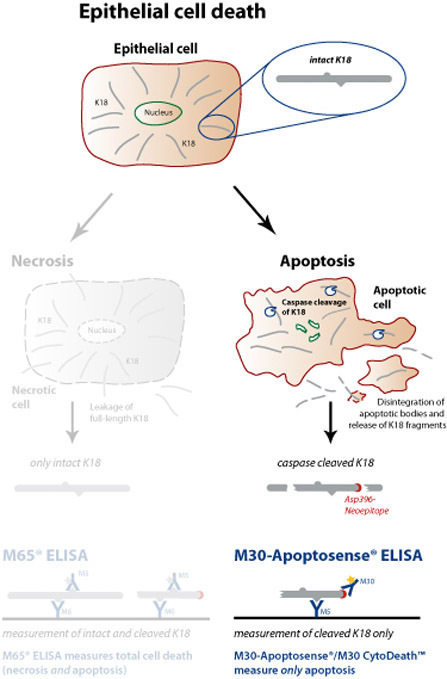 The specificity is reliable because the M30 Apoptosense® ELISA solely quantifies the accumulation of soluble caspase-cleaved keratin 18, a product of apoptosis. The assay is intended for subject serum or plasma. Another useful application is the detection of tumor apoptosis in mouse xenograft models using plasma samples. 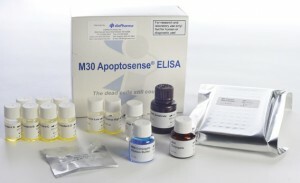 M30 Apoptosense® is an ELISA assay based on the M30 monoclonal antibody (Leers et al., 1999). This antibody specifically binds caspase-cleaved keratin 18 (ccK18, caspase-celaved cytokeratin 18, ccCK18 or K18-Asp396) but does not bind native, uncleaved, K18. The M30 Apoptosense® assay therefore represents a specific quantitative test for apoptosis in epithelial cells (Hägg et al. 2002). All reagents are provided in a convenient ready-for-use format. The separable strips provide the flexibility for your experimental design. Hepatology: Research shows that apoptosis is increased in liver disease. CK18 is highly abundant and critical for normal livers. Apoptosis can be measured in liver disease subjects. Note: M30 Apoptosense® ELISA was previously sold under catalog # P10010. Remarkable stability of the CK18 protein complexes in the circulation, thus providing stable storage of serum/plasma samples and allowing for multiple freeze thaw cycles. M5 Coated Microstrips: One microplate, 12 strips with 8 wells each, 96 dry wells in total. The wells are coated with mouse monoclonal K18 antibody M5. The microplate is sealed in an aluminium bag, which contains a desiccating device. If not all the strips are used, reseal the bag and keep the desiccating device inside. Ready for use! M30 Conjugate: Concentrate (24 × conc). One vial containing 0.4 mL of mouse monoclonal M30 antibody (anti-K18Asp396 neo-epitope) conjugated with horseradish peroxidase (HRP) in phosphate buffer with protein stabilizers. Preservative added. Should be diluted with M30 Conjugate Dilution Buffer. Note: Do not expose to light. M30 Conjugate Dilution Buffer: One vial containing 11 mL of phosphate buffer with protein stabilizers for dilution of the M30 Conjugate. Preservative added. Blue colored. M30 Standard A–G: Standard A containing 2 mL of phosphate buffer with fetal calf serum (FCS). Standard B–G, 0.5 mL each, containing standard material in phosphate buffer with FCS. The values of Standard A–G are 0, 75, 150, 250, 500, 750 and 1 000 U/L, respectively. Preservative added. Yellow colored. Ready for use! Standard A can be used for dilutions of samples > 1 000 U/L. M30 Control Low & High: Two vials containing 0.5 mL of reactive components in phosphate buffer with FCS. The values of M30 Control Low and M30 Control High are stated on the respective vials. Preservative added. Yellow colored. Ready for use! Wash Tablet: One tablet for 500 mL of prepared wash solution. Dissolve the Wash Tablet in 500 mL of fresh deionized water. TMB Substrate: One bottle containing 22 mL of TMB (3,3’,5,5’-Tetramethylbenzidine) Solution. Note! Do not expose to light! Ready for use! Stop Solution: One vial containing 7 mL of 1.0 M sulphuric acid. Ready for use! Sealing Tape: One (1) sheet. The M30 Apoptosense ELISA is a solid-phase sandwich enzyme immunoassay. Standards, controls and samples react with a solid phase capture antibody M5 directed against CK18 and the HRP-(horseradish peroxidase) conjugated M30 antibody directed against the CK18Asp396 neo-epitope. Unbound conjugate is removed by a washing step. TMB Substrate is added. The color development is stopped and the absorbance is read. The resulting color is directly proportional to the concentration of the analyte. By plotting a standard curve from known concentrations versus measured absorbance, the amount of antigen in the sample can be calculated. The concentration of the antigen is expressed as units per liter (U/L). The kit contains calibrators and controls, and can be used in any laboratory. Calibrators and controls contain recombinant peptides, which include M5 and M30 epitopes. The test can provide a result within 5 hours. Standard ELISA equipment is used and thus the M30 kit offers and easy to use format that should allow wide accessibility for testing. 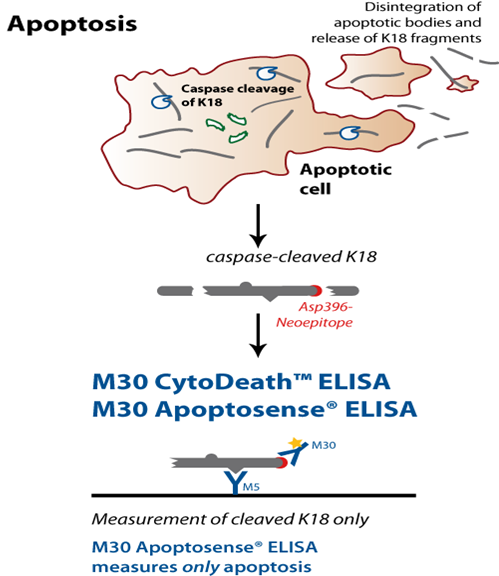 The M30 Apoptosense® ELISA detects human, but not mouse/rat, CK18. The detection of CK18 in the blood of a mouse carrying a human tumor xenograft is therefore due to apoptosis of the human tumor cells. Olofsson et. al (Cancer Biomarkers, 2009) used a slightly modified protocol allowing for less volume (12.5 µl sample) and used an additional blocking agent added to the conjugate (ie, HRP Plus). 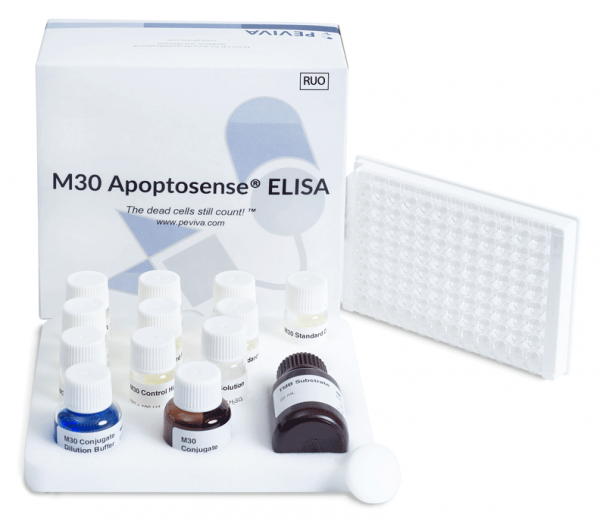 Development of the M30 antibody into an ELISA represented the first research tool to measure a specific apoptosis product in the blood. The M30 Apoptosense® ELISA measures the levels of soluble ccK18 fragments containing the K18Asp396 neo-epitope. After induction of apoptosis in epithelial tissues, ccK18 increases are observed in the blood. Caspase-cleaved K18 fragments are remarkably stable in human serum, further adding to convenience and the easy to use method of this ELISA.